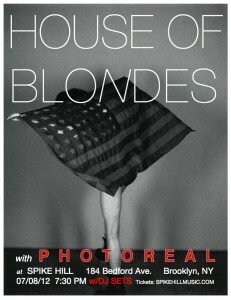 We are giving away a pair of tickets to see the House of Blondes at Spike Hill on July 8th along with a copy of their new album Clean Cuts. To enter, e-mail us your name to Here by Jul7 6th. When > july 8, 2012 at Spike Hill. 7:30pm.